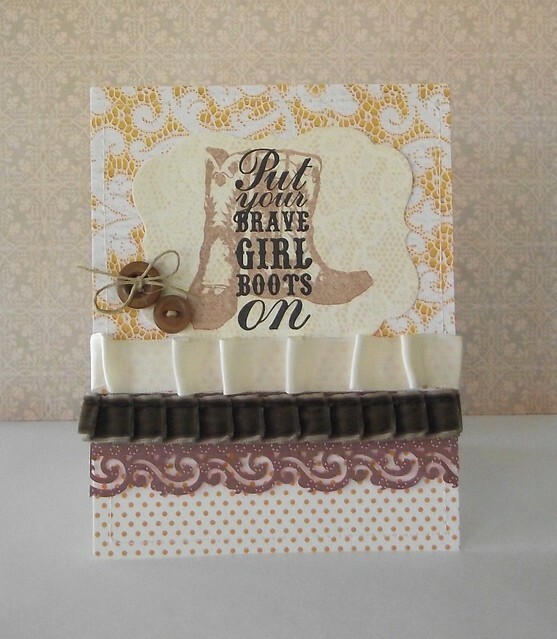 Now how you ask did this picture inspire me to create my boot kickin', lacey, velvet ribbon inspired card? Well, the chairs in the picture are so pretty, but to me the stamped boots capture the same lines, and designs as the chairs. I used vanilla satin ribbon from Offray, and beautiful patterned paper from Sassafras Las. 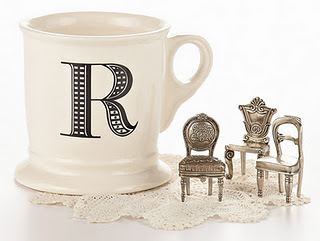 The font of my sentiment also matches the monogram "R" in the picture! I used PTI's Mat Stack #4 that I stamped the CHF Lace backgrounder stamp on using A Muse Studio Latte pigment ink. So subtle, yet so pretty. The punched border was created with the EK Success "Swirl" edger punch. (A punch I received in my PC magazine World Card Making Day prize package!) I hope you like my card as much as I do, and always, thank you for visiting my blog today!